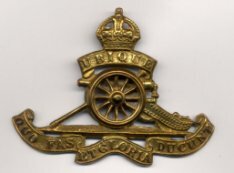 Example of an RFA cap badge. Albert Parr is recorded on the Bottesford list of Absentee Voters, 890194 Corporal, Gen. Base Depot, Egypt, RFA (Royal Field Artillery), his home address at High Street, Bottesford. There is a degree of confusion regarding his full name, in that he is plain Albert Parr in some listings, but Albert Edward Parr in others, and in the Electoral Rolls he is Arthur Parr. Albert Parr was born about 1884 in Bottesford. His parents were William Parr, born in Roxholme, Lincs, in 1849 and Ellenor Geeson, born in Redmile in 1851. In 1891, Albert’s father worked as a railway signalman and the family lived in the houses at New Railway Halt. Frances, John, Florence and Albert George, the Parr children, were all at school. By 1901, William Parr had died, and the family was living at 1 High Street, Bottesford. Albert was a baker’s apprentice, perhaps at the nearby bakery/grocery shop owned by Samuel Levick. His brother John was a butcher. In 1911, the family was living at 9 Greenhill Road, Grantham. Albert Edward Parr, now aged 26, was working as an engineer’s clerk. He shared the house with his mother Eleanor (Ellenor) and his sisters Frances (35) and Florence Mary (30). In this Census, he is recorded as Albert Edward: this is perhaps the first record in which his second Christian name is given. In November 1912, he married Beatrice Emily Allcorn (born 1886), in Grantham. 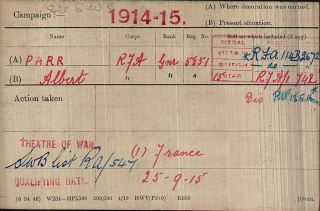 Very few of Albert Parr’s service records that have been located. These comprise his Medal Index Card (MIC), information in the Bottesford list of Absentee Voters, and an obituary notice published in 1961 by the Grantham Journal. The MIC states that Albert Parr was 5851 Gunner, Royal Field Artillery, and that he entered the French theatre of war on the 25th September, 1915. 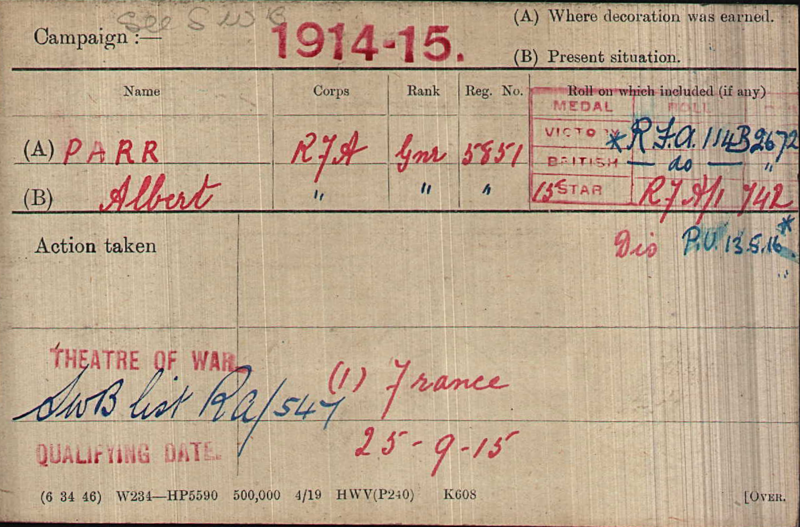 Albert Parr was awarded the 1915-Star, the British War Medal and the Victory Medal. However, the information recorded in the Absentee Voters list for Bottesford was that his Service Number was 890194, and he was a Corporal, RFA, at the General Base Depot in Egypt. Finally, his obituary in the Grantham Journal, in September 1961, added that he had served in the Royal Artillery in Palestine during WW1. The best interpretation is that he fought first in France, starting in 1915, and then was transferred to Egypt and fought in the Palestine campaign. The Electoral Rolls record a Beatrice Parr and Arthur (not Albert) residing at 13 Dale St., Manvers, Nottingham, from 1920 to 1927, and then the Roll for 1929 records that Beatrice and Albert Parr lived in Easthorpe. It is hard not to suspect that this Arthur was not in reality Albert, though not clear why this discrepancy should have arisen. Later, the Parrs lived at ‘Ladysmith’ on Belvoir Road in Bottesford. A report in the Grantham Journal on the 8th April, 1949, referred to “A. Parr, Building & Painting Contractor, Ladysmith”. Albert Parr became a well-known Methodist preacher, whose religious work and social life are recorded in the Grantham Journal from the 1930s at least until the early 1950s (the online newspaper archive ends at this date). His death was registered at Melton Mowbray in September 1961, when he was 77 years old. Beatrice Emily Parr born 12th January 1886, died in 1984, her death registered in Melton Mowbray. If this information is correct, she was 98 years old. The service records that have been located are very incomplete, and do not for instance record his battalion/s. There is also a suspicion that he may have first been attached to the Leicestershires at the start of his war service.